A gushing press release from New York Public Radio station WQXR announcing Clemency Burton-Hill's appointment as Creative Director, Music & Arts proclaims that "As the host of BBC Radio 3’s Breakfast Show, she helped to welcome a new audience to classical music". 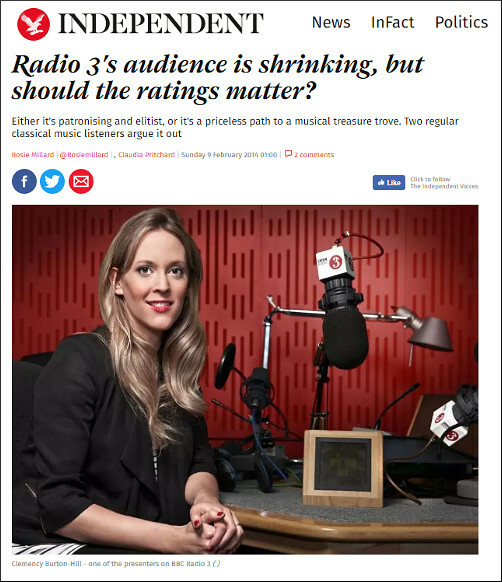 Which is somewhat at variance with the hard facts of Radio 3's recent dismal ratings performance and the headline of the Independent article above over a photo of Clemency Burton-Hill. But that notwithstanding, I am delighted Ms Burton-Hill is off across the Atlantic to work her magic on WQXR. Now please could Stateside classical stations recruit Petroc Trelawny and the remaining new audience-chasing Radio 3 presenters who have so effectively made the station a no-go zone for me and many others. On An Overgrown Path is no longer linked on social media. New posts are available via RSS/email by entering your email address in the right-hand sidebar. Any copyrighted material is included for critical analysis and will be removed at the request of copyright owner(s). Norman Lebrecht, who is normally highly critical of the current BBC Radio 3 regime, is effusive in his praise for Clemency Burton-Hill and her new appointment. Presumably Norman is hoping for a gig at WQXR.